What is the Etymology of La Rioja? When I first heard the name “La Rioja” I made the grand assumption that it derived from a geographic location. Why? Because if you’ve taken Spanish 101, you will immediately recognize the word rio in the name, meaning river, while oja can translate to “watch out!” or “look out for”. Hence, I assumed that name either meant “a dangerous river worthy of your caution” or “an incredibly beautiful river to look out for”. Although I felt pretty confident in my theory, I’ve already confessed that our knowledge of Rioja is relatively slim at this point. So, I donned my student cap and turned to John Radford’s book, The Wines of Rioja for a more expert opinion. According to his book, the commonly held theory by wine writers and Rioja lovers alike is that La Rioja’s namesake is based on the River Oja, which feeds into the Tiron river, passes through Haro and eventually flows into the famous rio Ebro. Now although this doesn’t explain why the entire region is called La Rioja, it’s an undeniably practical theory. However, as I continued reading through the Radford’s alternative theories behind La Rioja’s origins, suddenly, the popular namesake rio Oja had equally sound competitors. John lays out five possibilities, all interesting, and all worthy of our consideration. So compelling are some of these arguments that I thought it would be fun if we had a little vote. When you finish the article, please take a moment to share which theory you stand behind in the comment section, maybe because you simply like the theory or because you find it to be the most logical. indicated that the name Ogga was used for the lands watered by the rivers Oja and Tiron, and when Spanish (rather than Latin) became the language of literature, this became, in archaic Latinate Castellano, Rivo Ogga, then Riojia, then Rioxa, and then (j, g, and x having been very interchangeable in early Spanish orthography) settling down as Rioja. When John gets into this particular theory, he unfortunately doesn’t give any background as to who Hubrecht is other than referring to his authoring the book on La Rioja. So, I tried to do a little research on my own, leading me to find Hubrecht as the author for over dozen books on both Spanish and French wines. Hmmm..note to self. According to John, Hubrecht proposes at least three theories as to where Rioja gained its name. Eventually the Ruccones tribe evolved into the name Riugones, and transformed again when referred to by the Spanish as Riojanos. 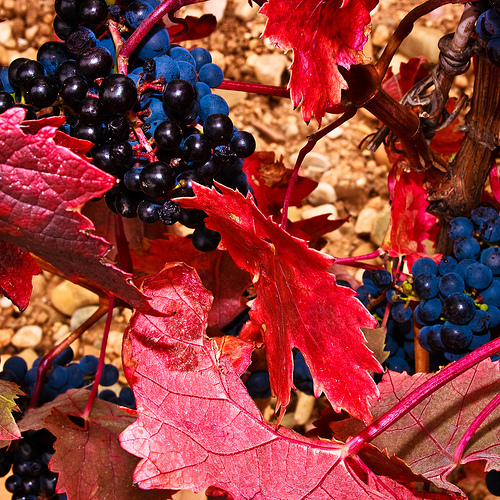 Hubrecht’s second theory is based on the Spanish word for red, translated as rojo, describing the rusty color of the of the iron-rich soils of Rioja Alta. His third and last theory, as described by Radford, derives from the northern Spanish region of Pais Vasco. Here, the Basque people may have created the name Rioja based on the Basque construction of the word “bread country” as Eria-ogia, which has also been written as Erriotxa, Errioxa, and Errioja. The fame of Rioja wine was further enhanced by pilgrims on the Camino de Santiago, which passes through the region from east to west via Logrono, Navarrete, Najera, and Santo Domingo, at which last point the camino crosses the rio Oja. How many millions of people have passed this way since the shrine was established in AD 816? And what was the experience like? John goes on to describe the state of a weary pilgrim, thirsty for water and food, exhausted from hours of travel and desperately in need of rest and recovery. Upon seeing the Domingo de la Calzada, a small pueblo housing a monastery offering free lodging, food and wine to passing pilgrims, our traveler is ecstatic. Recharging his batteries in the warm and generous confines of the monastery, he takes off the next day for his final destination, the cathedral in Santiago de Compostela. At this point, John poses a question to the reader: if we wanted to write a note of thanks to the monks who fed and sheltered us at the Santo Domingo, what directions would we give the pilgrim heading back down the route? Would we say, “To the brothers of the monastery of Santo Domingo de la Calzada, at the point where the Camino de Santiago crosses the rio Oja….”? Yeah, I think I would absolutely give the same instructions. Now, if the returning pilgrim had listened attentively to my story, he would also know that this monastery not only has warm soup made with freshly picked vegetables, but also delicious wines made from grapes grown in their backyard. Eventually, one might assume that this area near the rio Oja is famous for their artesanal wines. Although I have yet to travel the Camino de Santiago, I have been in the town of Santiago de Compostela where the emblematic cathedral stands as a beacon for the weary travelers who are still embarking on this route not 1000 years after its first wave of popularity. With autumn’s light casting shadows across the square where Ryan and I sat last September, I could overhear tables of pilgrims sharing their adventures, some with tear-filled eyes brimming with joy that their life has forever been altered for the better, while others seemed nonchalant as if the journey was merely a tick on a pole of accomplishments they’re accustomed to achieving. John’s theory reinforces the thrill of the pilgrimage and memories that are embedded over the course of the journey. These memories encompass everything from the antiquated tradition of free lodging for any pilgrim (a traditional that is still honored to this day) to the strange faces that may now become lifelong friends. It’s a beautiful way to define a region, irregardless of its legitimacy. Personally, I’d like to believe its true. Which of John’s theories do you feel is most accurate and what’s convinced you of it’s legitimacy? 1. Derived from the word ogga. 2. Derived from a tribe of invaders called Ruccones. 3. Derived from rojo, describing the iron rich soil of the region. 4. Derived from the Basque word for “bread country”, Eria-ogia. 5. Derived from pilgrims crossing the rio Oja.